Part 3: So here I am in the Boeing 787 Dreamliner. It’s the greatest and most advanced aircraft ever designed by Boeing. With a plastic body and LED lighting it is billed as the most comfortable way ever devised to fly. In my first five minutes while trying to turn on a reading light I pressed a button and sprung open the oxygen masks. I pushed the only switch next to the lights, and it turns out to not be a light switch. Embarrassed, I am switched to another seat while they duct-tape the mask hatch closed. Comfortably settled and now in-flight I start to relax. (My goof resulted in the plane taking off late.) And, when I relax I like to put my feet up. One of the nice things about being in Business Class is that you can do exactly that. The footrest is one of the sacred things you get in Business Class. 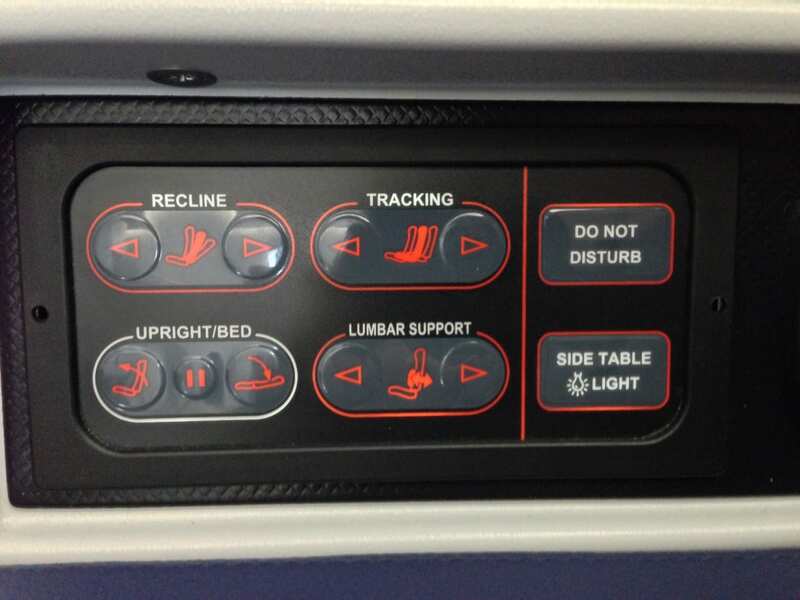 Most airlines provide some buttons that you can press and the footrest electrically comes out of its hiding place, supporting your legs and feet. With your seat tipped back the experience is much like sitting in a recliner chair in your living room. It’s divine. Now, which switch was it? Hmmm. My previous blunder with the overhead light switch left me a bit cautious. I didn’t want to press the wrong thing and perhaps end up with a disco ball popping out, or something like that. The icons and the words seemed to be in agreement, but I didn’t see which would do the footrest. I pondered, and then I decided that caution was in order. Ruining one seat was forgivable, but to have two catastrophes could mark me as an undesirable passenger or perhaps get me onto one of those infamous “lists” from which you can never get removed. I called a flight attendant to ask how to operate the footrest. She looked at the control panel. And she looked. And, she started pressing buttons. And no footrest appeared. She looked around the footrest, and we both looked for levers, as I was in the aisle and she was on the floor, trying various things. Another flight attendant joined us in the search, on another seat close-by. Then, the purser showed up. (the “purser” is the lead flight attendant on an airplane, it is a weird title, isn’t it?) together, the four of us attempted to reverse-engineer the seat to find the release for the footrest. Ever wary of pressing oxygen mask release buttons, I mostly stood back and watched. The three of them fiddled for a while, and then they headed off down the hallway and huddled. Now, this answer didn’t pass the “sanity test.” It’s just not possible that the most popular feature in business class wouldn’t exist. I know when I am being “snowed” and to be told that Business Class seats on the 787 Dreamliner didn’t have footrests was eight up there with being told that the airplane didn’t have wings. Then, s-l-o-w-l-y it hit me: Boeing and ANA had successfully hyped the first ever airplane to have a Business Class and NOT have footrests. I cannot fathom what process the bloated committee that designed the airplane interior went through, but I would have loved to be the fly on that wall. How does a group of perfectly sane, above average IQ people come to the conclusion that footrests are unnecessary in a seat that rents for $7,500 per ticket? I can understand eliminating the built-in lumbar massage feature. Nobody ever used that. But footrests? They are used all the time on every flight? I made a note in my notebook to use the footrest example as one of the best examples I have ever heard of about why committees design poor products. Also, I would tuck in a reminder to include a few people that actually consume a product before putting a design into production. I also realized then that industrial engineering is a lost science. Years ago, industrial engineers would have studied every feature used on an airplane,noting what percentage of people used the feature, how many minutes it was used, and what importance the passengers placed on the feature. An industrial engineer would have concluded that footrests were right up there with padded cushions and breathable air. OK, I had had two laughs in my first 787 Dreamliner flight. It would make for some good stories. 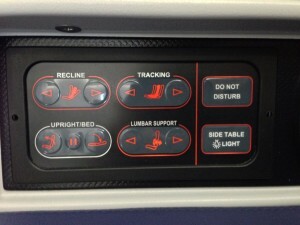 Part 4: My trip aboard the Boeing 787 Dreamliner had started eventfully. 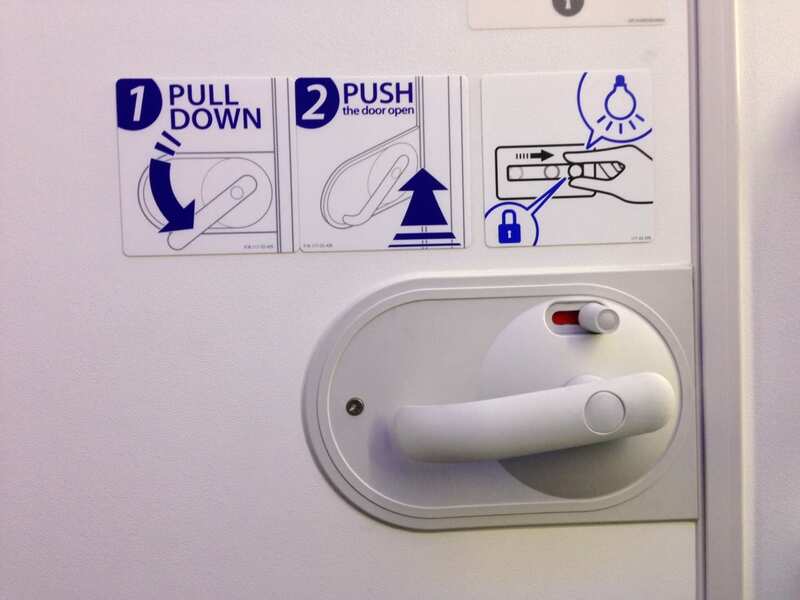 First, I had pressed a light switch button that turned out to release the oxygen masks. Next, I lead the flight attendants on a quest for non-existent footrests. This trip was turning out to be quite an adventure. But things seemed to be settling down. Flights to Asia are 12-16 hours long. At best they are uncomfortable, but mostly they are miserable. After a few hours the lack of oxygen and boredom means that the cabin gets quiet and they darken it and you get ready for sleep. My seat had a feature that was unique to it: it sported the universal symbol for a public bathroom. It was an illuminated sign with the icon of a man and a woman and a wall between them that means “toilet” in 174 different languages. It had no words, it was just the icon illuminated with a bright light. I don’t know why it was there…my seat was most definitely not a public toilet. What did it mean? Why was it there? And more importantly: was there some hidden meaning to my seat being the designated toilet location. Would people start showing up, thinking I was using the toilet? After staring at the sign announcing my seat as a public toilet it became annoying. It was very, very bright. In fact, it actually cast a shadow of myself on my seat. To my way of thinking, it is not necessary to shine a flashlight at somebody, much less a toilet sign that seemed oddly placed. Then, as if in response to my glaring at it, the sign changed to being red in color. After a while it changed back to very very bright white. Periodically I would glare at it and it would change to red and then back to white. All the while I kept thinking: “Why is it there above only my seat, and why must it be so bright?” Mostly, I wondered why it was where it was…it was certainly not announcing the location of the toilets in the aircraft. The auto-suggestion of the sign eventually lead me to decide to find the toilets and to use them. I found the bathroom on the 787 Dreamliner amazing. If you have ever wanted to join the “Mile high club” the Business Class bathroom on a 787 is the place to do it. It is large, even spacious. It is well lit. And it even has a window. I mean, a real, live window that you can look out. Or, at least you could look out of it if you were able to spin your head around 180 degrees like in the Exorcist. But still, this bathroom was a notch above any other. 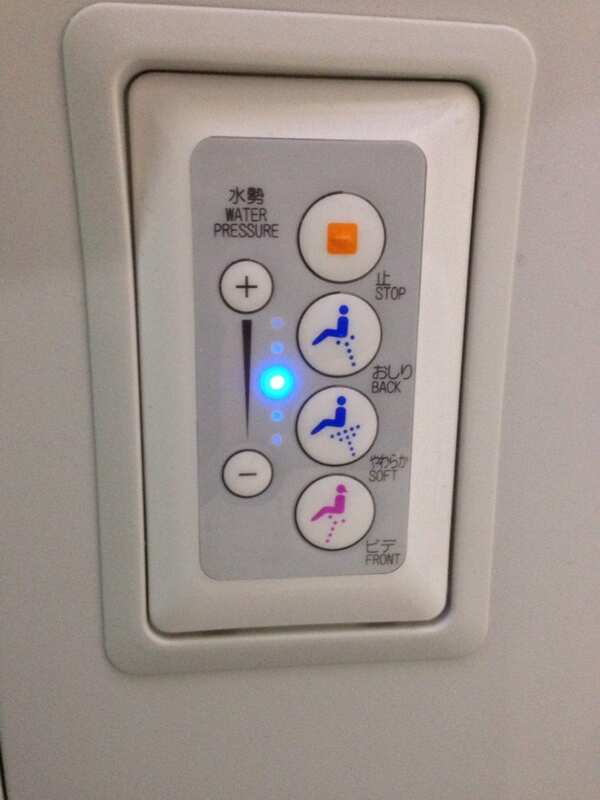 Now, the Japanese love their “washlets” as they call them. They are computerized bidets that at the touch of a button will wash and sometimes even dry you. To us Americans they seem silly, but the feeling of cleanliness is admittedly nice. Pressing the buttons did, indeed, shower and wash with warm water appropriately sprayed. 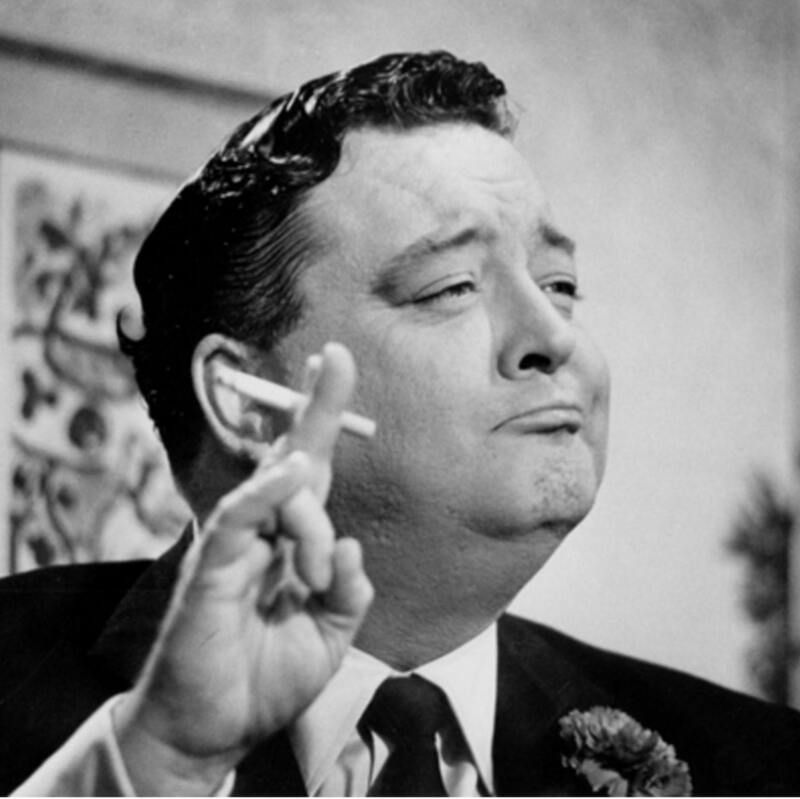 I rather liked the idea of an airline….ahem. But the washlet was simply to lull me into a false sense of safety and comfort. A moment later there was a loud “whooshing” sound that would have made Ross Perot proud. My immediate thought was that there had been an explosive decompression of the main cabin. My heart pounded…but I was safe inside of the bathroom. Then, I realized that I was being sucked into the toilet. It wasn’t really enough to do much, except to for an instant make me recall that episode of Mythbusters where they tested if it was really possible to be sucked into a toilet. I remembered the outcome of that, and felt safer. It stopped. And then it did it again. And, as I reached for toilet tissue it did it again! I got up and looked for the flushing lever, wondering if it had inadvertently hit it and if that was what was causing the flushing. 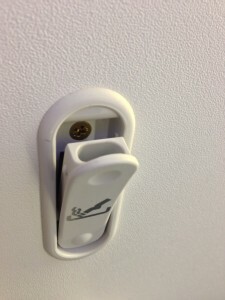 And, then I saw yet another stroke of Boeing genius: a motion detector. Yes, behind you on the toilet wall is a motion detector. If you move in the wrong way the toilet will flush, and will flush again, and again. If you are the right size or shape it seems you can set it off with just sitting on the toilet. This seems like unnecessary engineering. Why not just flush the toilet automatically when the door is opened and the light turns off? Why even have a finicky motion detector. And, that leads me to my next adventure…getting out. Now, in most airplane bathrooms you just flip a lever and push and you are out. I cannot remember even really thinking about the task of freeing oneself from a lavatory. But the 787 Dreamliner’s toilets serve the purpose of being jails. They have a latch that you rotate and then push on the door but the door doesn’t open. I followed the instructions, which seemed to pretty obvious. But I still couldn’t get out. A sat down and studied the instructions (should one really have to study instructions on how to exit a toilet?) I was reminded of those “Wordless Workshop” cartoons in Popular Science on how to build things. I followed the instructions, nope, the door still wouldn’t budge. After studying the mechanism I thought to first operate the deadbolt and then rotate the knob and then push the door. Voila! Free at last! Now, I would probably have had no problems had I just tried to get out. But I followed the instructions and that is where I went wrong. The instructions are incorrect! If you follow the printed instructions you skip the all important step of unlatching the deadbolt. Why had I had such problems with a simple toilet door? The answer is that the Boeing 787 Dreamliner is unlike any other aircraft. Exiting requires operating two latches whereas all other airlines require a single latch. Many doors, like hotel room doors will spring open the deadbolt when the door handle is rotated. But the 787 does not do this. The result is a door latch that is an unconventional multi-step process that requires instructions…and those instructions leave out the one non-obvious and essential step. Does Boeing have any human factors engineers? I started to ponder this question as I went back to my seat to stare at the flashlight-bright toilet sign. I still couldn’t figure out why my one seat would be signed out for having a toilet sign. If it was just a lavatory occupied sign then why wasn’t it located where it always was: above the aisle? I will admit, the experience in the bathroom was overall very good, except for the getting out part. I will most definitely get another punch in the mile high club membership card on a future trip when I am not alone. The 787 Dreamliner lavatories were designed for that purpose, clearly. But the adventure begins…in my next posting. PS: this appears to be the world’s smallest ash tray. It is located in the bathroom. 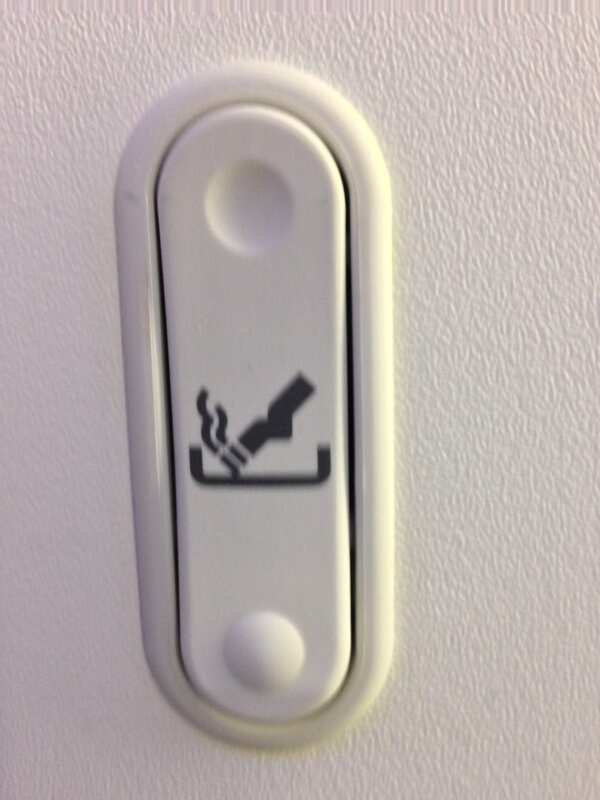 At least, I think that icon is of a cigarette. It is the size of a coat-hook only. Perhaps it is someone else. I really couldn’t figure it out. 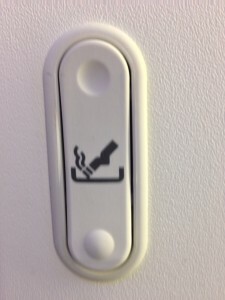 Aren’t you supposed to not smoke on any commercial aircraft? Or, is it OK in the bathrooms? How odd.